The high mortality of infants under one year of age and the short adult life expectancy in industrial cities meant that funerals, and all their associated paraphenalia, were big business in Victorian times. There would be "awful hearses drawn by preternatural quadrupeds, clouds of black plumes, solid and magnificent oak coffins instead of the sepulchral elm, coffin within coffin ...", as The Times commented in 1875. 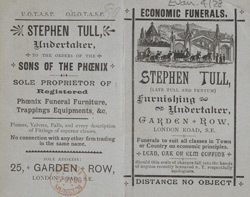 Stephen Tull, in this 1889 advertisement for his "economic funerals", sought to satisfy the desire for a lavish, expensive and somewhat theatrical display at rates to "suit all classes in town or country". His illustration shows a funeral procession about to enter a landscaped, public cemetery - perhaps one of the seven commercial cemeteries established between 1837 and 1841 outside the residential suburbs of London. Planned by the London Cemetery Company, they were designed to relieve the over-crowding in London's small churchyards and prevent any health risk to those who worked or lived nearby.